Securing a guest appearance can add a whole new dimension to your event and be the big draw that pulls in the crowds. In a society that revels in the aura surrounding the famous, securing a well-known or well-respected guest to speak, perform or just mill around can have a seismic effect on your event pull power. The guest might turn up to lecture on a subject or honour an occasion with a speech, or even just declare your event open! Rather than entertain the fanciful notion of a major movie star appearing at your event, it’s better to think local - a local sports hero, author, the town Mayor, or your Member of Parliament. For community events a local celebrity can actually have a more inspiring and uniting effect than a big star because they are more in tune with the local people and issues of the area. If Tom Cruise turned up to your village fete, there may be an instant wow factor, but beyond that he would be out of touch with the people and culture, and appear like a fish out of water. Also his guest appearance might end up overshadowing the purpose of the whole event. Ultimately big is not necessarily better. Securing the services of a well-known celebrity can also be a costly business. There are numerous agencies available whose job it is to find the ideal ‘face’ to entertain your guests, but their rates can range anywhere from several hundred pounds to several hundred thousand. Unless you have a bottomless budget, it is wiser to seek more cost efficient alternatives, such as a local figure or charity ambassador. If you are organising a charity or campaign event then you might be able to attract a famous face for free. This would be great publicity for your cause and, of course, reflect well on the image of your star. To find a suitable candidate, start by quizzing your charity or campaign group, or use the internet to find out whether any celebrities have been publicly linked to your cause. If you want to obtain a celebrity guest then the best advice is to get to work early; if they’re important then they’ll likely have busy diaries to match. You should start approaching potential candidates once you’ve decided on the date, location and a clear idea of what the event is about. They are much less likely to commit if your event is still just a few vague scribbled notes on a piece of paper. You also need to get your guest booked if you want to use them as a way to promote your event. If you manage to book a guest to your event, then be sure to treat them well and show a degree of professionalism. 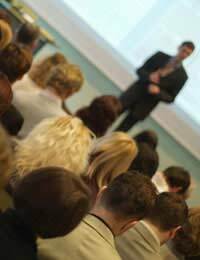 Guest speakers should be given a detailed summary of the event aims and programme and what you expect from them. Some other aspects of visit that might need considering include whether you need to organise and finance their travel arrangements, who is in charge of looking after them whilst they are at the venue site and whether they need any equipment aids for their speech, such as an overhead projector.